Samuel Sanderson was born at Waltham 8 Sept 1748, died at Lancaster 24th July 1803, Son of Johnathan and Mary (Bemis). He was sergeant in a detachment from Lexington militia company commanded by Capt. John Bridge, service 5 days; detachment reported on command at Cambridge from 11 May to 15 May 1775, by order of Committee of Safety; also corporal, pay-roll of a detachment from Lexington militia company commanded by Capt. John Parker, service 2 days; detachment reported on command at Cambridge from 17 June to 18 June 1775, by order of Committee of Safety; also private, Capt. John Briges company, Col. Eleazer Brook’s regiment, service from 4 March to 8 March 1776, 5 days; company stationed in Roxbury. He Married 27 Oct. 1772 Mary Munroe, born 10 Oct 1748, died 15 Oct 1852, daughter of William and Rebecca (Locke). ii. Samuel, bapt. 2 Feb 1777; m. 25 Mar 1802 Eunice Lawrence of Waltham, d. 23 Oct 1847: d. at Waltham 18 July 1829.
iii. Mary, bapt. 26 Dec 1779; m. 1803 Daniel Clark of Salem, who d. 31 Mar 1830; d. at Salem 18 Aug 1821.
iv. Isaac, bapt. 4 Aug 1782; resided at East Cambridge. vi. Lydia, m. 12 Dec 1820 Erza Fisk of Weston, who d. 17 Oct 1831, age 53. A witness of the first revolutionary conflict, she recounted its trying scenes to the last. The vitality of her Christian faith was envinced by cheerfulness under severy bodily infirmity for more than twenty years. A few rods from the Tavern, down the road toward Boston were two more Lexington Homes, on opposite sides of the street, and so quite near to each other. They are still standing (1912). In the one on the westerly side lived Samuel Sanderson, a member of Capt. Parkers company. He was not at home, so they killed his cow instead, not for food, but for the pure pleasure of killing something. Evidently landlord Munroe’s liquor was having some effect, if not in making the men braver, then in making them more brutal. Sanderson did not report the amount of his loss to the legislature. To the east of Munroe Tavern is the Sanderson place, in 1775 this long low house was occupied by Samuel Sanderson and his wife Mary Munroe Sanderson, to whom he was married in 1772. With them was his brother Elijah. These two Sandersons were cabinetmakers. At a later period Elijah lived in Salem and from time to time sent venture of cabinet to France and Spain where they sold well, for the old New England joiner was an artist and made all kinds of woodwork from Pine coffins to the most beautiful desks and sideboards. (Mary) …She was the daughter of one of the Munroe’s in that part of Lexington known as Scotland, and was born in 1748. She married Sanderson in 1772, he worked at his trade as a “Jiner” in the basement of the house, and his wife often held a candle as he made a coffin. When he heard that the British were coming he piloted his wife over to her father’s carrying his babe, and accompanied by a little girl who was at their house. Over at Scotland they found the mother getting breakfast and the brothers at first did not believe the report. After the British retreated Mary returned home and found a good many things had been stolen. Her cow (which was a good part of her marriage portion) had been killed; and a wounded British soldier was stowed away in her bed. She cried out “ I wont hae him there. Why didn’t you knock him on the head?” But the town authorities insisted he be taken care of. Those who lived on that part of Lexington called Scotland had a little of the Scottish accent and Mrs. Sanderson kept it all her life. The soldier begged for Tea but she refused. “what for should I gae him tae for? He shall hae none.” The wounded man refused to eat or drink unless the food was tasted by some of the family. The Sandersons moved to Lancaster in 1776 but after her husbands death she returned ot Lexington and died there in 1852 at the age of 104. When her husband heard that the British were coming he took her across the meadow to her father’s on Woburn road. When he brought her back at night they found a British soldier left in the house who was too sick for the British to take with them. She also found that they had killed her cow. She said she would not feed the soldier. They told her she must. So she did. She said:” I gae him enough to eat but gae him a devilish honing with it.” He would not eat anything until some of the family had tasted it; he was afraid she would poison him. She lived to be 104 years old and as late as 103 she would tell this, in her Scotch dialect, to visitors who called on her home in East Lexington to hear her tell her story of April 19th. on alarm as part of detachment to Cambridge as Sgt. Samuel Sanderson from May 11th 1775 to May 15th, both days included, by order of the Committee of Safety, John Bridge, commander. called to Cambridge on June 17th,18th leb by Capt. Parker, “repaired promptly to the scene of action, and offered themselves for active service” during the battle of Bunker Hill. Samuel Sanderson (no rank) on the muster roll of Capt. John Bridges of Lexington company in Colonel Elieazer Brooks regiment on command at Roxbury from Mar 4,1776 to Mar 8, inclusive. his brother Elijah Sanderson enlisted for 3 years and served in the Continental line. Deposition given by Cpl. 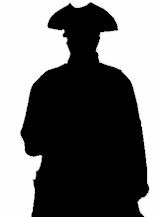 Samuel Sanderson and 13 other minutemen: 19th April, 1775 and P133 American Rebels, John Harris, Boston Globe and Boston Globe, Lexington-Concord Alarm. 9279. Mary Bemis. Born on 10 Mar 1722/3 at Watertown, MA.11 Mary died on 26 Aug 1801.
x. Anna Sanderson, b. 13 Apr 1762, m. 20 Mar 1786 Isaac Peirce. On 26 Feb 1744/5 Mary married Jonathan Sanderson, son of Samuel Sanderson & Mercy Gale, at Watertown, MA.11 Born on 24 Feb 1713/4 at Watertown, MA. Jonathan died at Waltham, MA on 31 Mar 1780. Jonathan's will was dated 26 Jan 1780. His estate was valued at £867 10s 11d, including a 70 acre farm (Middlesex Co. Probate, No. 19803). Sanderson, Samuel, deceased July 24, 1803.